4th axis to the PROXXON miller FF 500/CNC. For perfect 3D processing! For individual parts and small series production. 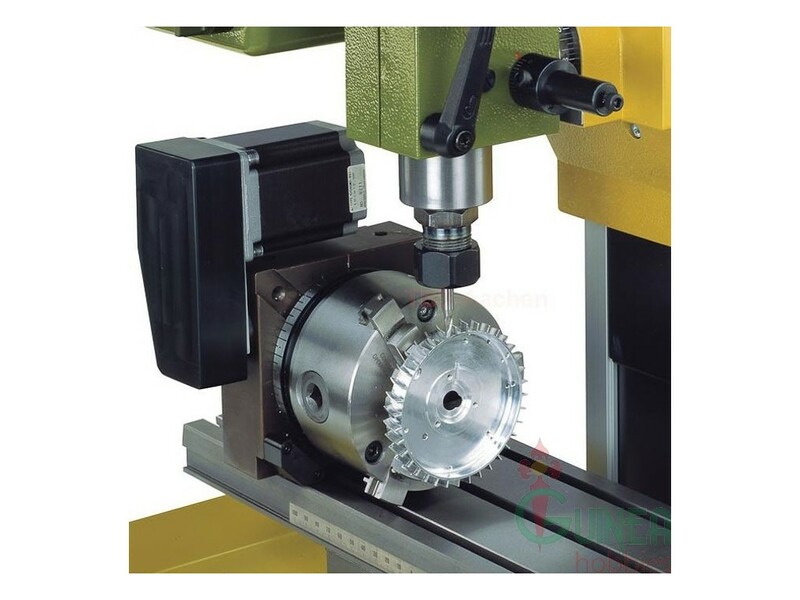 For manufacturing divisions, gear wheels, helical gearings, screw spindles and (including irregular) profiles. All angle positions can be approached by computer control. Easy horizontal and vertical construction. Driven by powerful step motor (2.0A) through toothed belts, and virtually free from play, adjustable worm gear. The high transfer ratio (40:1) provides enormous torque. Main spindle with 14mm drill hole and flange to suit face plates and all lathe chucks from the PD 400 lathe system. Smallest increment 0.003°. Recognition of reference position through light barrier. Chuck and work pieces are not included in the package. Click the button below to add the Dividing attachment UT 400/CNC to your wish list.